Home » OTL101 » Let’s get this started! 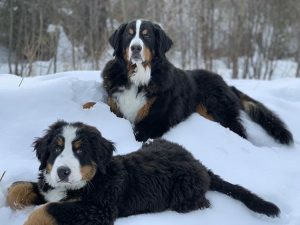 My name is Tyla Charbonneau and I live in Fernie, BC with my husband and two Bernese Mountain Dogs named Fezzik and McConkey. I believe the most important aspect of high quality online learning environments from an instructor perspective is personal engagement with a creative flair. I think the more of a presence I have online and the more feedback and questions I provide the more students are engaged in their own process. Additionally, I think we need to be creative in how we teach so that we can reach as many learners as possible. Something I have learned in the last year about teaching is that you never know what else a student is going through outside of classes and that kindness is always the way to go, especially through emails and discussion boards. I like to assume they are doing the best they can and offer suggestions and appreciation when a student reaches out for help. I do not currently have any questions about this process with TRU but I am sure I will as I go :). I was unable to make Wordle work after many attempts. I find this to be a normal learning curve for me with new aspects of technology. I laugh sometimes when I have to ask my 17 year old niece for help with Instagram or other online programs. We joke about me being just like Nana! I enjoy the challenge and embrace the learning that comes with new programs and love the sense of satisfaction when I figure it out. Reflection on the questions was also helpful as I have been teaching for a few years and do not often take the time to think about what I belive in or what I enjoy/find challenging about the work. This was a nice way to explore my role in teaching and think about my growths and ares to continue to explore.